These stock pushrod covers are beautifully plated duplicates of the Harley part. Replaces late OEM # 17938-40. Panhead/Shovelhead 1948-Early 1979. Replaces OEM # 17938-48B. Shovelhead L1979-1984. Replaces OEM # 17938-79. Ironhead Sportster 1957-1985. Replaces OEM # 17937-57B. 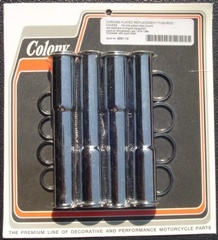 Colony Stock #'s 7824-12, 7823-12, 2091-12, 7822-12.